Nigeria: Why Do Nigerians Continue to Tolerate a Mediocre Govt? As Nigeria lurches from one incompetent government to the other, why has there been no meaningful attempt to take on the entrenched political elite? Since the independence of Nigeria in 1960, the people have never experienced good governance. From one coup to another, from one former military ruler to another, the backbone of Nigeria's governance has been its elite - and it has remained unchallenged to any meaningful extent throughout the country. In 1984, Muhammadu Buhari was Nigeria's head of state. He introduced the "War Against Indiscipline", which saw soldiers parade the streets of the country, frog-marching and beating up people. In 2015, he was elected into office with a massive majority as a "reformed military leader" who had learnt the ways of democracy. In 2019, he was re-elected into office. The winning argument: his main challenger, Atiku Abubakar, a former vice-president under Olusegun Obasanjo, was said to be corrupt. The irony: Buhari's tenure in power saw no reduction in corruption in the country. In their book Why Nations Fail, Daron Acemoglu and James Robinson give the example of Egypt. They say, "To Egyptians, the things that have held them back include an ineffective and corrupt state and a society where they cannot use their talent, ambition, ingenuity and what education they can get. But they also recognise that the roots of these problems are political." 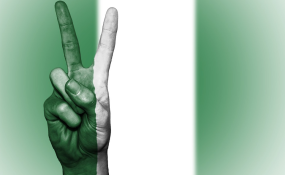 If asked what has held Nigeria back, the average Nigerian will give the same response. While the Nigerian recognises the root of the problems, unlike his Egyptian counterpart he does nothing about the problems. In fact, in most cases, he supports that very problem with the hope that things will get better. And while things get worse, as they always do, the elite continues to secure their position in the political landscape of the country. Acemoglu and Robinson further state that the Egyptians recognise that "all the economic impediments they face stem from the way political power in Egypt is exercised and monopolised by a narrow elite". It was this narrow elite that the Egyptians wanted out when they went in huge numbers to Tahrir Square. While movements such as #OurMumuDonDo have tried to galvanise Nigerians to reject the elite and demand better governance, the response has been nothing but a shut mouth. The youth of Nigeria, the largest group of victims of these incompetent governments, have equally been the ones championing and defending one elite candidate after the other. Any space for meaningful intellectual rigour has been shut down by emotional outbursts about which elite is more corrupt than the other. The fact that the youth has no sense of a shared destiny is a misfortune that has led to warped notions and ideas, for example that anything is defendable - including when soldiers opened fire on Shiite protesters in Abuja last year. While more people sink into poverty, and the huge brain drain continues, there are fears of things going south all of a sudden - or will people just continue to go about their normal lives as the elite push them further into oblivion?